In these tough financial times, GDL Studio looks to get the most bang for its charity buck. 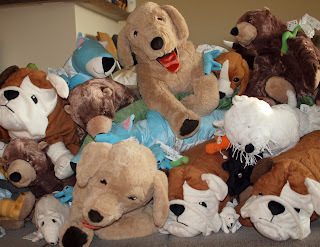 GDL Studio recently purchased a few dozen stuffed toys from IKEA, which gives a dollar to UNICEF and Save The Children for each toy sold. We then transported this fuzzy herd to a Washington, DC-area Toys for Tots collection site. There's still time for you to help make some kids' holiday season a little brighter! ow GDL Studio realizes it is December, but there is one tidbit from summer we’d like to share. 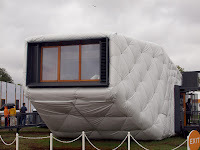 One advantage to living in the Washington, DC, area is the National Solar Decathlon arrives every two years. College teams design and build experimental homes that don’t draw power from the grid. As the competition’s name implies, solar power is big. One entry stood out for external and internal reasons. From a distance, the Southern California Institute of Architecture and California Institute of Technology team’s entry resembled a giant pillow. The structure seemed more like astronaut housing for Mars as opposed to something that could blend in with a smattering of suburban ranch-style homes. The students were probably tired of answering questions about using special vinyl fabric siding instead of metal or wood material. But they patiently explained that just as traditional houses need to be repainted or re-sided every once in a while, you would need to change your house’s fabric cover. Maybe it would be easier to patch a hole in your fabric wall versus needing to replace damaged metal siding? 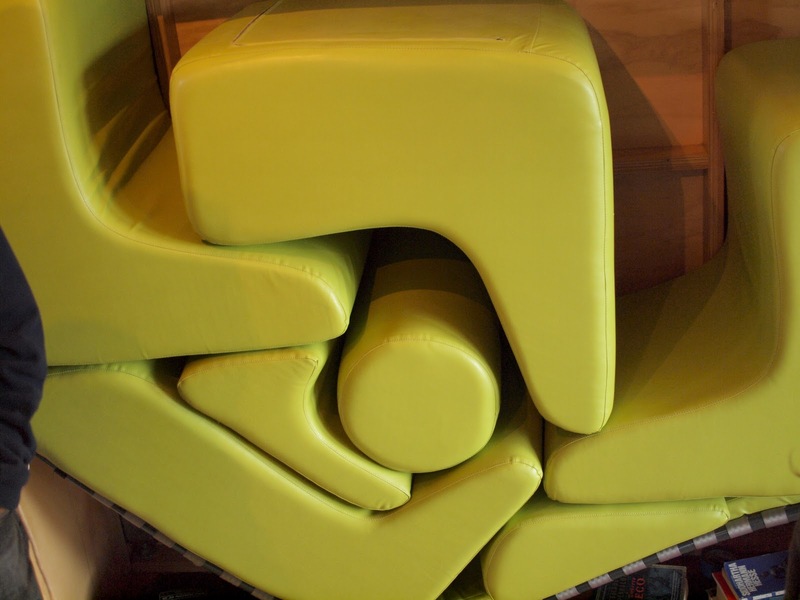 GDL Studio is not ready to move into a fabric house, but we did see some funky flexible furniture showcased. Most competition homes are pretty small. 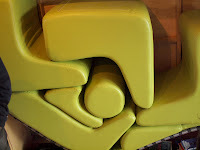 Since floor space is at a premium, a student designed seating of various shapes that can be stacked into a Tetris-like formation. The lightweight pieces can be pulled out when needed and stowed against a wall. ost likely you’ve never noticed what the periodic table of elements is missing: J and Q. 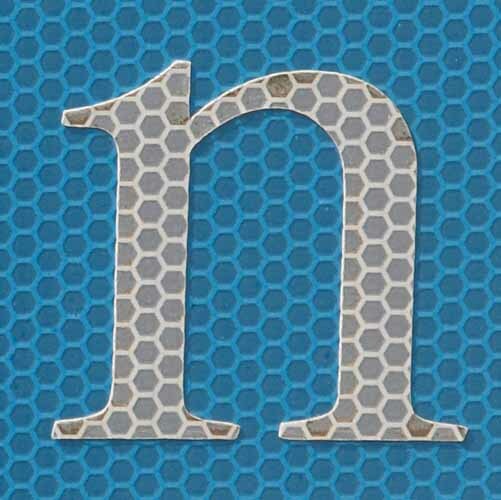 The recent announcement about two newly named elements poised to join the periodic table reminded GDL Studio of a typographical imbalance. There are no atomic symbols with J or Q. 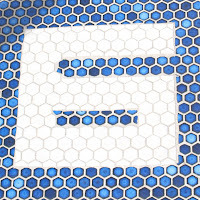 While GDL Studio provisionally welcomes Flerovium, Fl, and Livermorium, Lv, to the family of elements, this might be seen as a missed opportunity to get more of the alphabet involved in science. There is a public comment period now open on the proposed names, so there is a chance something could change with the names. Wondering which letter tops the heap on the current periodic table? R rings in with 19 appearances. A may lead off the alphabet, but it occupies second place on the table with 16 cameos. GDL Studio is (mostly) sure J and Q never did anything to anger the good folks who manage the official naming process, but now is the time to show some love to these missing letters. The naming process has a democratic element, so spread the word and weigh in with some choices to put J and Q on the periodic map. Who or what do you think is worthy of being honored with these neglected letters on the periodic table? ike most things in the evolution of GDL Studio, this announcement arrived later than originally planned. But at long last, GDL Studio has landed on Etsy. Just in time for the holidays, the Studio is offering a collection of design-savvy calendars on everyone’s favorite craftastic on-line marketplace. Calendars have been part of the story since GDL Studio was a just seed of an idea more than a decade ago. 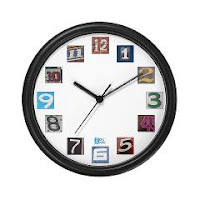 The first calendar was a spiral-bound glossy job printed at a Big Box office supply chain. 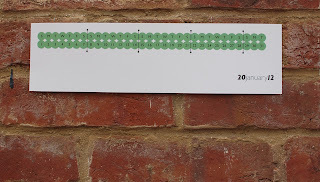 These days, the Studio is exploring the boundaries of calendar design (no more spirals or even staples) thanks to at-home color laser printing technology. GDL Studio 2012 Green Dot Calendar on Etsy. This year’s batch of calendars focus on typography, shapes, and symbols. (Not all on the same calendar.) If you’re looking for grid-based calendars featuring adorable puppies or weathered lighthouses or shiny race cars, don’t click on any links on this blog. 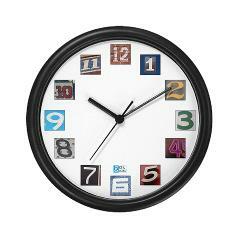 But if you are ready explore new ideas to mark the passage of time, check out GDL Studio on Etsy. nowing all the facts might have helped my Sunday visit to the National Gallery of Art in Washington, D.C. I wanted to see the Publishing Modernism: The Bauhaus in Print exhibit, which showcases printed material from the Bauhaus School. To my disappointment upon arrival, I learned it is a weekday-only exhibit. 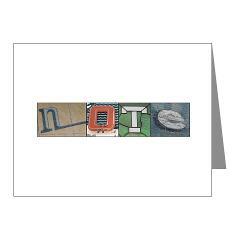 A consolation prize did catch my eye: Modern Lab: The Found Alphabet. Given my photographic focus, how could I pass this up? Shockingly, this is not a featured exhibit. I had to ask a security guard where to go. After winding through a few galleries, I found a broom-closet-sized room with about a dozen pieces of art. While I wouldn’t plan a trip for just this exhibit, if you’re interested in typography, it is worth a look. A Claes Oldenburg painting called The Letter Q as Beach House, with Sailboat, is oddly self-explanatory. The work features a giant, upside down Q posing as a house, with sailboat. 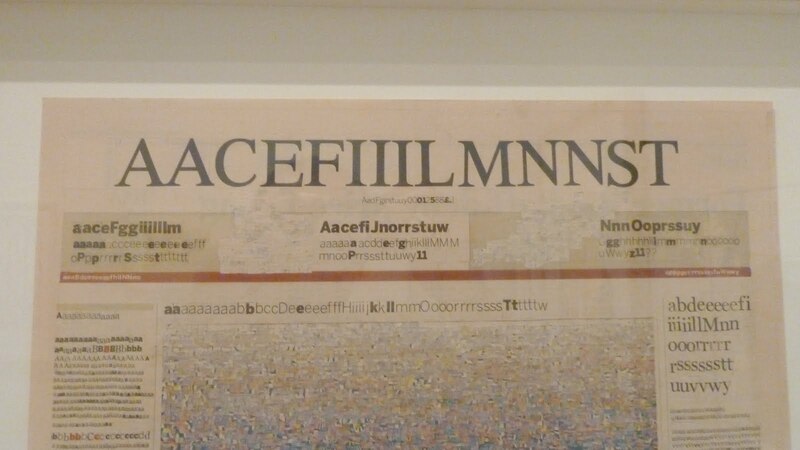 But my favorite piece was a deconstructed newspaper by Canadian artist Kim Rugg. The work, No More Dry Runs, is a front page of the Financial Times. All the letters are cut out and pasted back in alphabetical order. So FINANCIAL TIMES became AACEFIIILMNNST. A clever idea, though I can’t imagine how long it took. I’ll have to take an afternoon off to see the Publishing Modernism exhibit, which is open through October, 28, 2011. Just don't drop by on a weekend expecting to get your Bauhaus on. ust because we spend more and more time communicating electronically does not mean we should be reading the last rites to the handwritten note. In the spirit of helping people turn off their electronic devices (unless you are reading this blog), GDL Studio is proud to introduce note cards. Peace, Love, Thanks, Hello, and Note are the pioneering words at the launch of my stationery efforts. Each note card is blank inside allowing you unlimited freedom to create literature-worthy prose. Congratulations, you just went old school and sent a paper-based email! Keep watching this blog for more low-tech communication solutions. Follow GDL Studio on Twitter (@GDL_studio) or Facebook. nvestigating the magazine racks usually does not involve me stopping in the food section. But the design buzz about the new food magazine Lucky Peach prompted a detour into the dizzying array of culinary glossies. 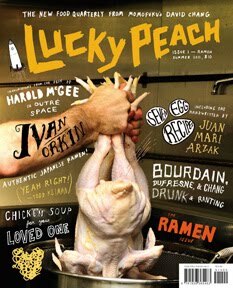 Lucky Peach’s first cover lived up to the hype with hand-drawn type and a de-feathered cover chicken. A two-page infographic on what happens to eggs at different temperatures stood out as did colorful hand-drawn illustrations that dotted the magazine's layout. As I started reading a lengthy ramen-centric essay on a culinary journey through Japan, I realized something was missing: ads. I flipped through all 176 pages and saw maybe three house ads with no outside advertising. Not that I minded, but even at $10 an issue, I am no t sure if that will be enough to cover all their production costs. I don’t know if they have an ad-free business plan or they just wanted a clean debut. I suppose one could argue the whole magazine is an advertisement. The top of the cover shouts “THE NEW FOOD QUARTERLY FROM MOMOFUKU’S DAVID CHANG.” The Japan essay focuses on Chang’s recent pre-earthquake visit to the island nation. Chang opened his New York City noodle bar in 2004, and he pops into in other stories in the debut issue. Since it is his magazine, he can do what he wants on the editorial side. But he might have to think about a few outside ads, unless he has major noodle money to burn through. inding a spot for quiet contemplation is not a problem in Washington, D.C. Small monuments to great minds, such as the Albert Einstein memorial, lie off the beaten path in the nation’s capital. Secluded memorials to half-forgotten patriots, like George Mason, sit in the shadow of structures honoring more famous founding fathers, in this case Thomas Jefferson. But my favorite hidden gem for peace and quiet is not among the area’s myriad monuments. My top spot for thinking is Kogod Courtyard. 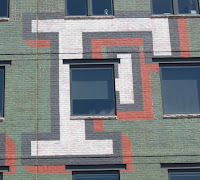 It combines history, modern architecture, and art. 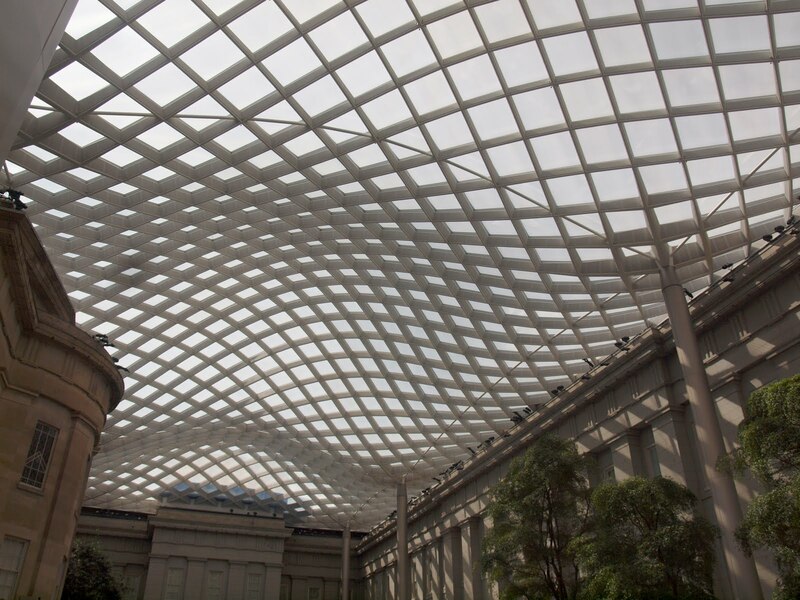 The courtyard lies between the National Portrait Gallery and the Smithsonian American Art Museum. While both are part of the Smithsonian, they are several blocks from the National Mall and are not obvious destinations for most tourists. The first tenant was the U.S. Patent Office in 1840. Maybe some of the innovation that once percolated through these halls still lingers, inspiring visitors. Even when brilliance fails to strike, Kogod Courtyard is still a nice to write, people watch, and relax. 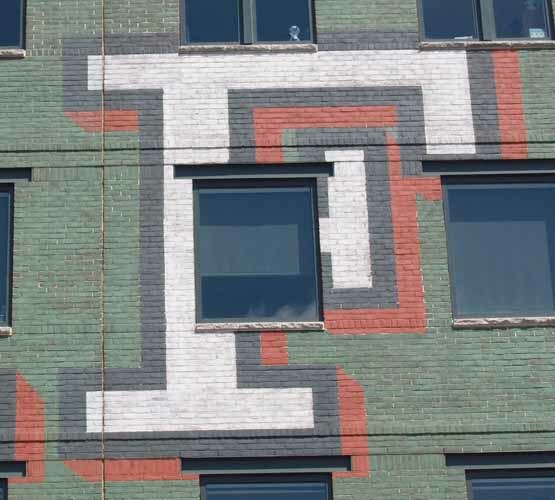 I am not the first to quietly hum its architectural praises. 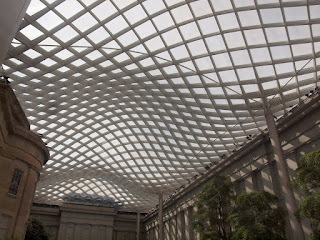 I love staring up at the wavy glass ceiling and the interesting shadows the crisscrossing steel frames create. 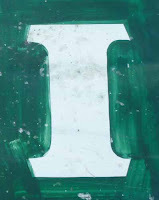 I wish I could say today’s “F” is found near the courtyard, but this letter comes from nearby Baltimore, Maryland. This and other letters are patiently waiting to be deployed. The wheels of progress continue to grind as GDL Studio approaches reality. I hope to make an announcement in early June. Thanks for your patience. verywhere you go, there is an immense amount of visual information in the built environment competing for your attention. Most of the time you tune out the “irrelevant” information. If you didn’t block out some of the information, you would never get to your destination on time. (Or you might drive off the road.) An interesting book that addresses this subject is “How to See: A Guide to Reading Our Man-Made Environment” by George Nelson, the prolific architect and designer. The book is out of print, but you can pick up a used copy on Amazon among other places. I bought the book a few years ago from Design Within Reach (this was actually within my reach at $30, unlike their sofas) when the company reprinted the volume. Just as the title promised, it provided a new perspective to how I look at the built environment. I had no idea how much I was ignoring each day. If you happen to live in an urban area, take a look at any given block and try to count the number of signs. There will be parking signs, traffic rules and warning signs, street name signs, address numbers, store and office signs, menus, advertisements, newspaper boxes, graffiti, and posters. Unless you are looking for something specific, you likely ignore most of this visual clutter. If you are driving, it is always a good idea to pay attention to some key road signs, but it can be tough to catch everything when they put up to 4-5 signs on each available post or utility pole. Nelson gives good examples of the types of driver-related visual information overload. 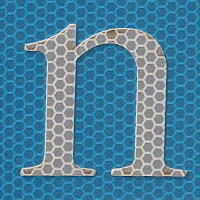 Nelson suggests there are some universal patterns in elements of the build environment, like the fact that manhole covers are generally round, metal and must have an opening so you can pick them up when needed. He also mentions fire hydrants as being universally the same. I have to say that I have run across some variations in hydrants. (OK, it took me a half-hour to find two hydrant photos in my collection, but I knew there was a reason I kept them.) 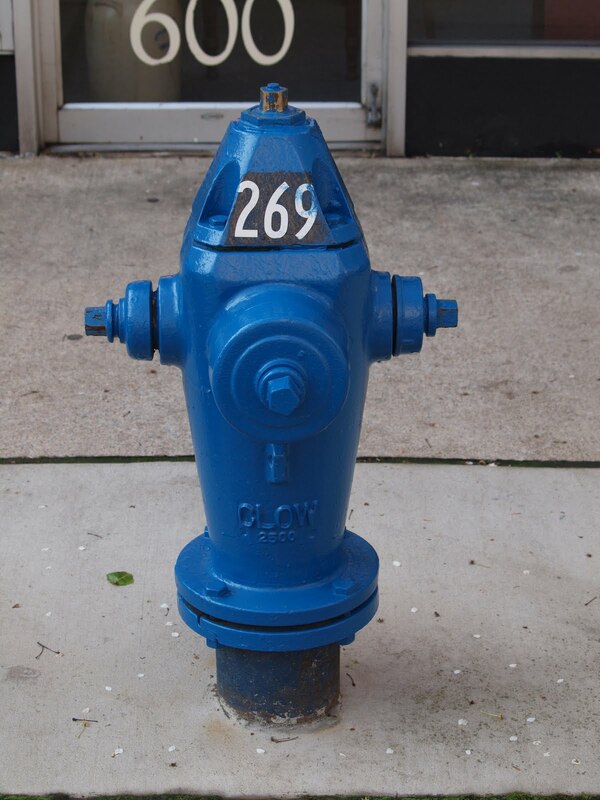 The blue hydrant, which seems more aerodynamic than any fire hydrant needs to be, sits in Bristol, Tn. 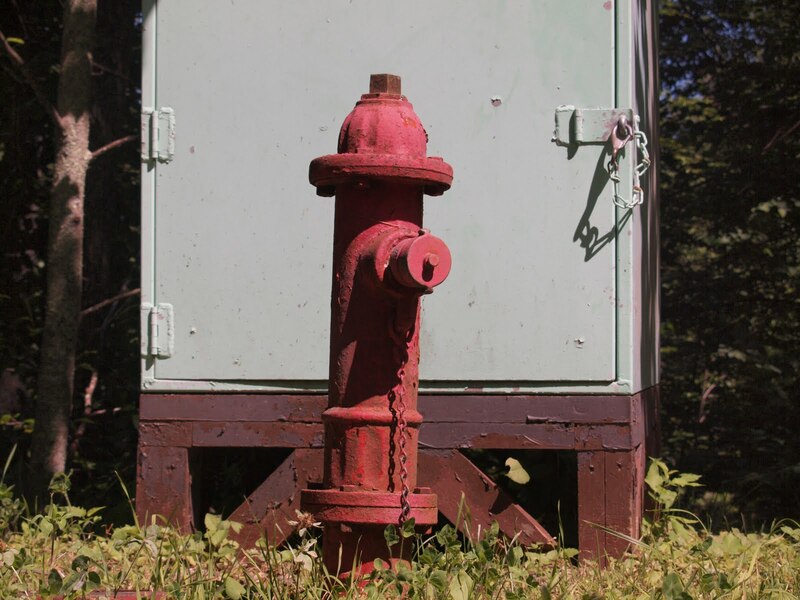 The red hydrant, which is super skinny, is on guard in Shenandoah National Park in Virginia. Both are deviations from the standard hydrant I grew up ignoring in upstate New York. 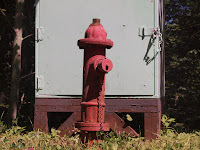 Anyone else seen any unusual fire hydrants? Am I the only one who now takes notice of fire hydrants? The "E" at the start of this post is from Charleston, S.C. Sadly, I have no South Carolina hydrants to offer. 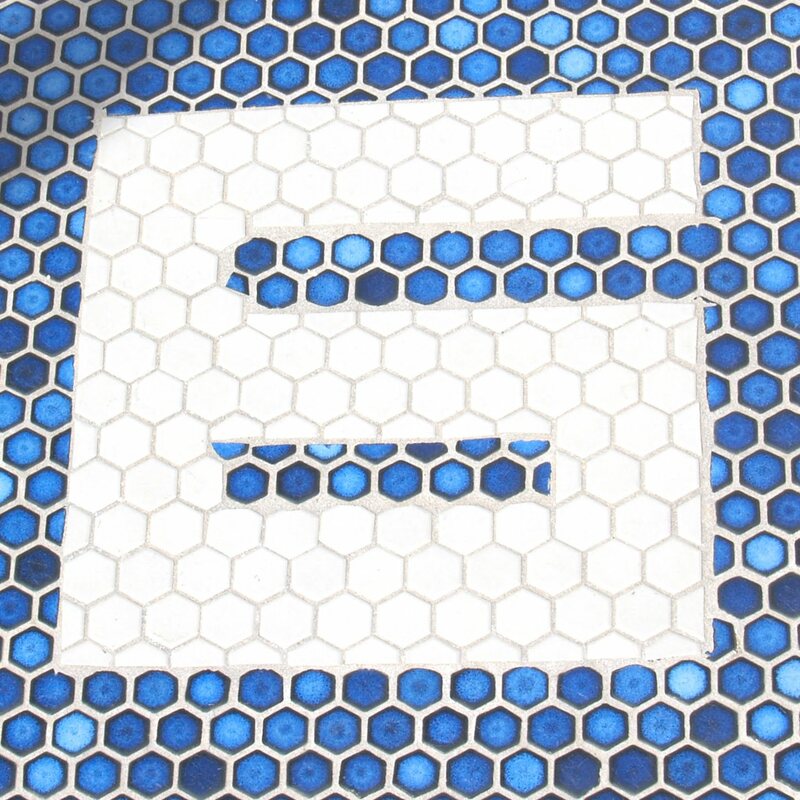 But in a few weeks, I will be using this and other "E"s as I launch GDL Studio. Just a few more Virginia bureaucratic hurdles to clear. I think I can see the finish line. 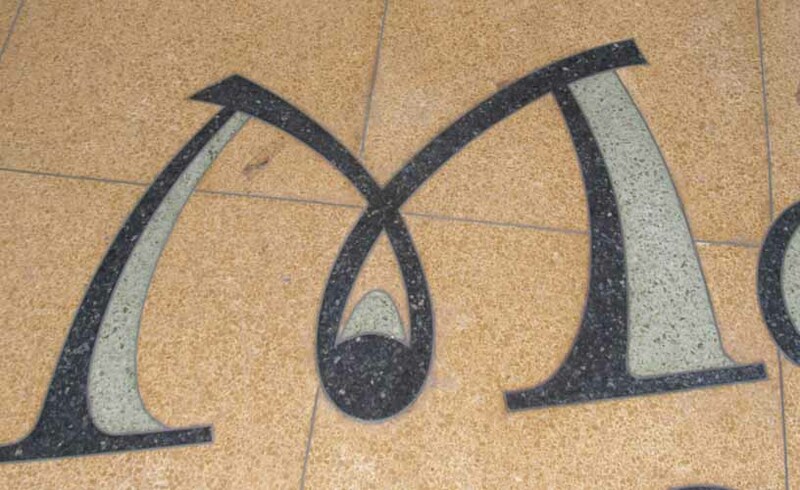 lowercase love in d.c., w.v. esigning good graphics seems to pose a serious challenge for many municipal government agencies. As I explore the region, I try to pay attention to what cities and towns are doing on the design front. 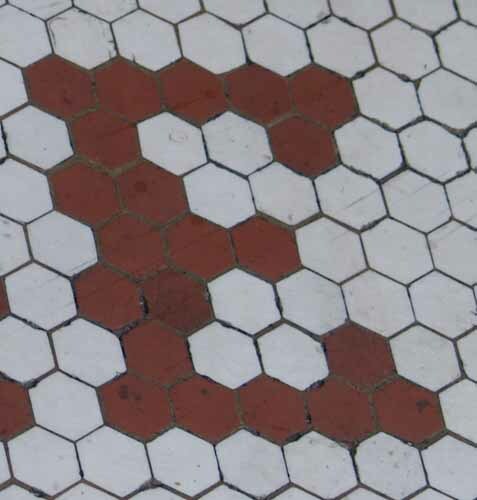 Usually, nothing really catches my eye. Once in a while you run across a snappy slogan. (Ashland, Va., has banners declaring itself the "Center of the Universe," which is no doubt backed up by some iron-clad astronomical measurements.) But Washington, D.C., and Bluefield, W.V., managed to make me take notice in small ways. Both cities offer interesting examples of designs that force you to think for a moment before realizing what information they are conveying. 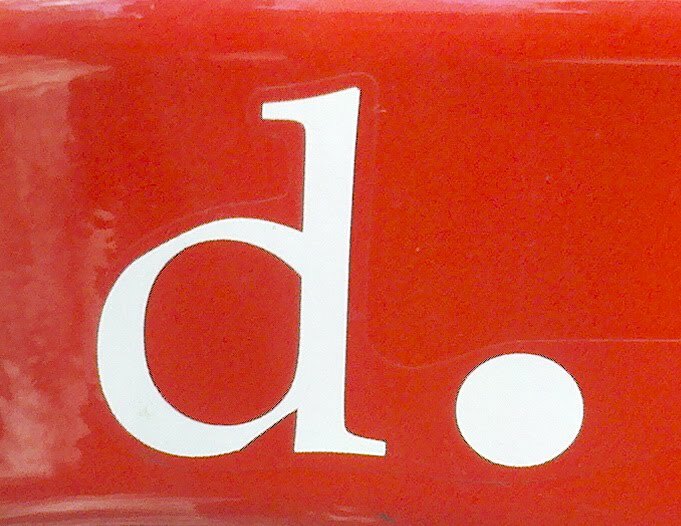 The first time I saw a "d." hiding along the streets of D.C., I wondered what exactly I was reading. A "d" and a period seemed like someone had made a mistake. Then it dawned on me that it should be read "D-dot," which is short for District Department of Transportation (DDOT). Fresh out of college as a newspaper reporter in the late 1990s, I wrote occasional stories on NYDOT, so it was a little embarrassing that it took me so long to decipher "d." I guess you could argue that a good logo shouldn't leave you wondering what it is trying to do. But I still love the minimalist simplicity and the choice of using a lowercase letter. Bluefield's exa mple is along the same lines. I am not sure if the city came up with the design or if the Bluefield Chamber of Commerce is responsible. Either way, it is a fun design. I first walked by this banner wondering why someone would just write the word "field" along the bottom of a rectangle. Once I remembered what city I was in, it hit me that someone had come up with simple way of conveying the name Bluefield without resorting to writing out the whole name. I also applaud the use of lowercase letters. Anyone out there have other examples of interesting government/civic graphic design? The "d" that opened this entry is from Easton, Pa. 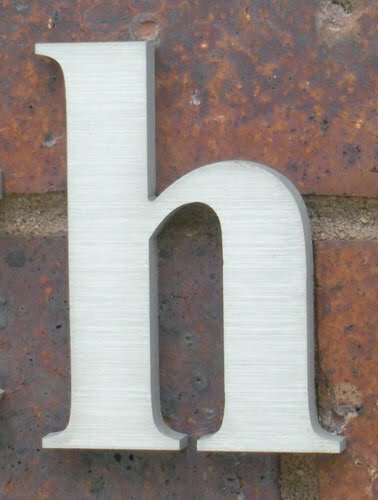 While it is not part of a great design, I felt it was in keeping with the lowercase letter theme for today. 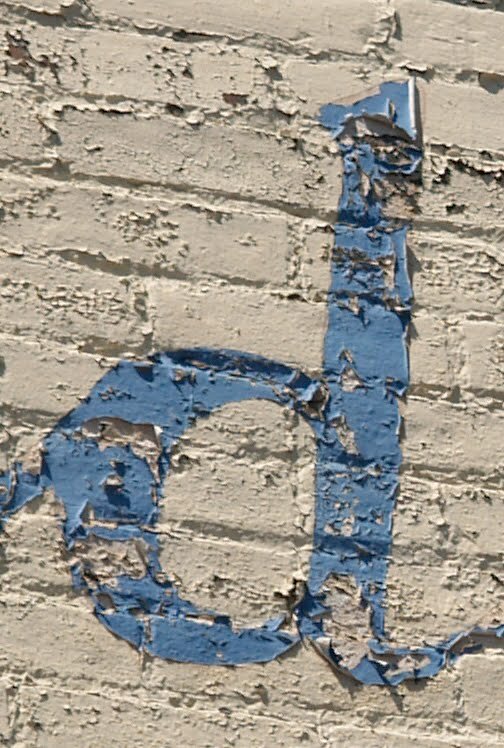 And this "d" will be in the mix when I open shop in the next few weeks. More details to come. hoosing a road trip destination is an art form. This past weekend I wanted the chance to further explore my new home state of Virginia. I spent a while staring at the map on Friday trying to decide what town might hold the next great letter or number for my collection. The town that kept calling my name was a little place called Bristol. I thought it was cool that the state border splits the town's main street down the middle. One side of the street is Virginia and the other side is Tennessee. Bristol held a healthy dose of mystery for me. I had high hopes of finding some great photos. As soon as I set foot on State Street, I realized Bristol is not so mysterious to a large number of Americans. In my defense, I am not a NASCAR fan or country music afficiando. So I was unaware that Bristol hosts a famous car race each March. I also was not aware that Bristol lays claim to being the birthplace of country music. Despite my lack of knowledge about Bristol, it turned out to be a great photo destination. 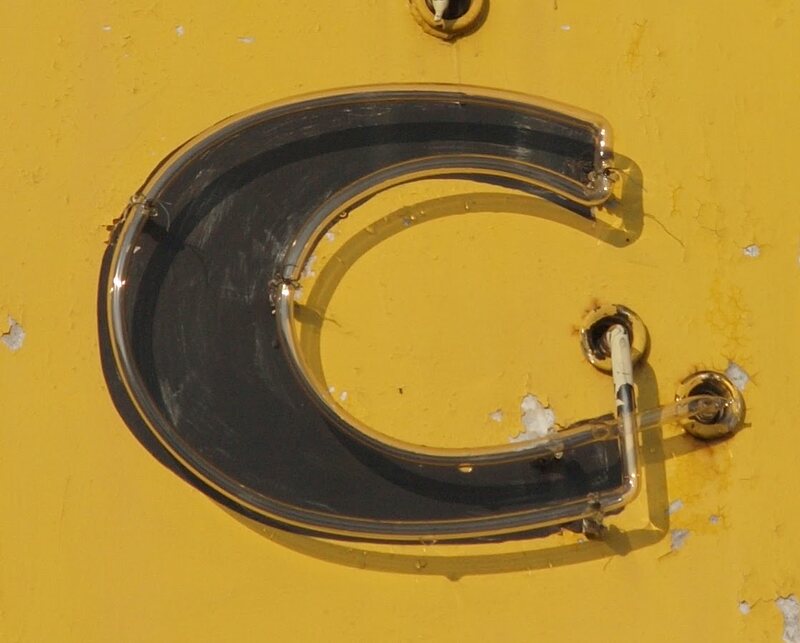 This "C" was hiding on a fabric store sign on the Tennessee side of town. 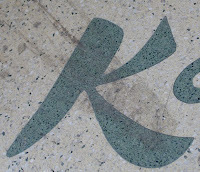 I harvested a healthy number of letters while wandering the walkable downtown area. While I spent a lot of time driving this past weekend, going from the northern end of the state to the southern border, it was a fun trip. I stumbled across several interesting sites along Lee Highway as it winds its way toward Tennessee. Just before sunset on Saturday I found the Moonlite Theatre, an old drive-in movie theatre near Abingdon, Va. As darkness fell, I broke out my camera and flashlight to do some "painting." I quickly learned people are pretty friendly in southern Virginia. At least 5 people pulled over to ask why I was walking back and forth shining a flashlight at a broken theatre sign. I tried to explain how setting my camera to a 60-second exposure and spotlighting parts of the sign could create a cool effect. But all I got was blank looks. One driver told me he watched the original Star Wars at the Moonlite. I can't tell whether the theatre is still open. The website says it is closed for the season. You can see one of my Moonlite photos on my new Flickr photostream. If the Moonlite is going to open this season, I hope they get the "O" and "E" back in place soon. Keep watching my Flickr account as I share my various road trips and local photo excursions. And I am inching closer to getting GDL Studio up and running. Thanks for your patience! uffalo, N.Y., is home to one of my favorite “B”s. 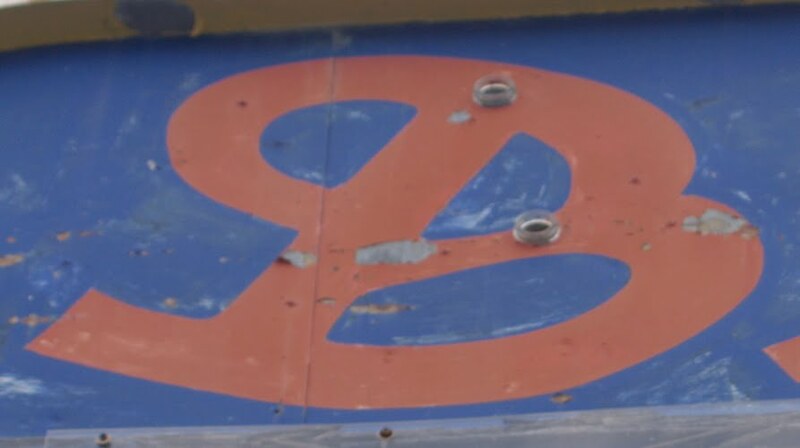 This letter was part of a sign for an abandoned drive-in movie theater I stumbled upon a few years ago. Despite growing up in nearby Rochester, I never had many occasions to visit Buffalo. While just 80 miles of interstate separate the two cities, the gulf between the two felt much larger. In my youth, Rochester seemed to live in Buffalo’s shadow. Maybe it was because Buffalo landed the bigger concerts, fielded major league sports teams, and gained culinary fame for its wings. Rochester did get some decent concerts. We cheered on our minor league teams, like the Red Wings and the Amerks. I suppose Rochester’s white hots are well-known to true hot dog connoisseurs. But Rochester still felt like a second-class city. As an adult, I have come to terms with the differences between Buffalo and Rochester. As part of this growth process, I took some time to explore Buffalo a few years back. The city has some interesting examples of faded glory to photograph, such as a massive decaying rail depot complex near downtown. Buffalo offered a wealth of letters and numbers to help me bulk up my photo collection. I don’t know that I would have appreciated what Buffalo had to offer when I was growing up. Today, I savor the feeling of seeing a downtown or main street with fresh eyes. I love the mystery that lies around every corner. Buffalo was no exception. There are many places on my “must visit” list I hope to hit this year. I am optimistic many of these towns will be worth photographing. Keep your eyes on this website in the coming months as I prepare to make GDL Studio a reality and share the images I have found. good place to start is usually the beginning. 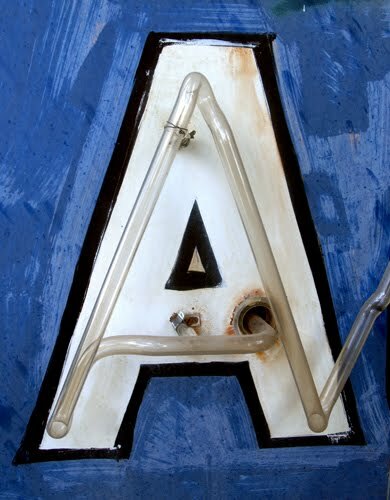 This is the "A" that sparked a journey. It is not the first character I found when I began scouring the country for letters. But this old neon "A" made me realize there were amazing letters waiting to be found. You just have to slow down and see the built environment in a different way. 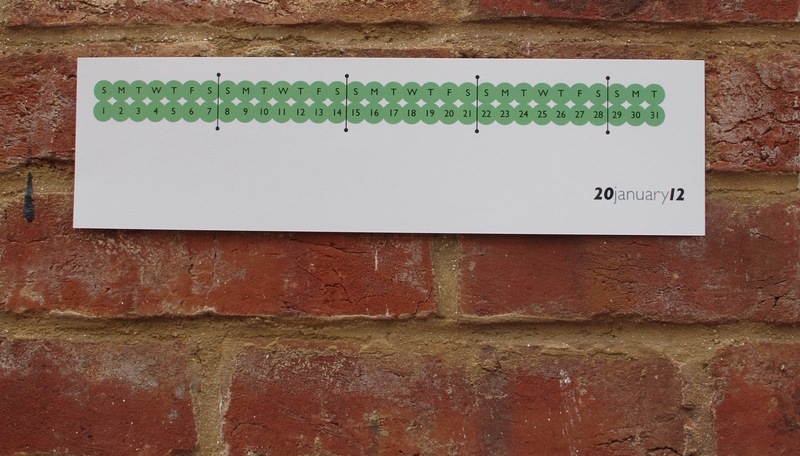 Most people barely glance at the hundreds of signs they pass every day. I see those signs as holding the next great "Q" or "Z" that will make my growing collection of letters better. This "A" was sitting with some rusting junk near an old store in northern Utah. My photo project started when I was a newspaper reporter in Utah. When covering stories along the byways of rural Utah, I began stumbling upon forgotten places. 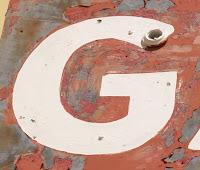 Rusting gas stations. Crumbling railroad depots. The more rusted metal and shattered glass the better. 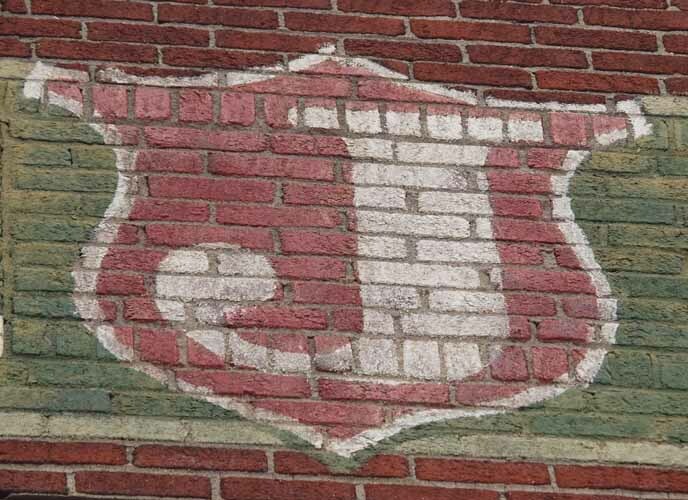 As I made it a goal to visit as many Western towns and villages as I could, I was disappointed that not every place had such examples of faded glory. But every stop had signs. The southern Utah towns that cling to Interstate 15 hide 1950s-era motels and old stores if you take the time to drive through these old downtowns. I began taking pictures of such signs. As friends started having children, it occurred to me I could crop letters from various sign photos and print baby names as gifts. 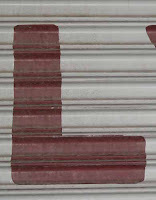 From that point on, I began to photograph all the interesting individual letters I could spot. 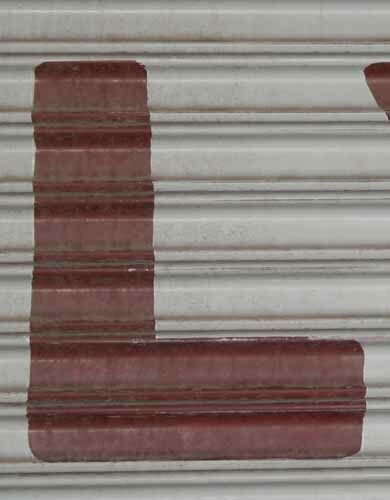 Every where I traveled on vacation or assignment offered a chance to find new letters. From Miami, Florida, and New York City to Coeur d'Alene, Idaho, and Altoona, Pennsylvania, I have photographed letters of all styles, colors, and materials. My collection now includes 100s of letters, numbers, and symbols with more coming each month. The next step in my journey will be to open an on-line shop where I will offer products made with some of my favorite letters and numbers. Special thanks to my friend Ben (you can check out his prolific blog Ben's Journal) for being the tech support that made this site possible. Keep watching this site for updates as I prepare to set up shop this summer.